It's that time of the month again, where I can look back on my outcomes and thoughts for each month. A way of creating memories both in my personal life and through my blog. 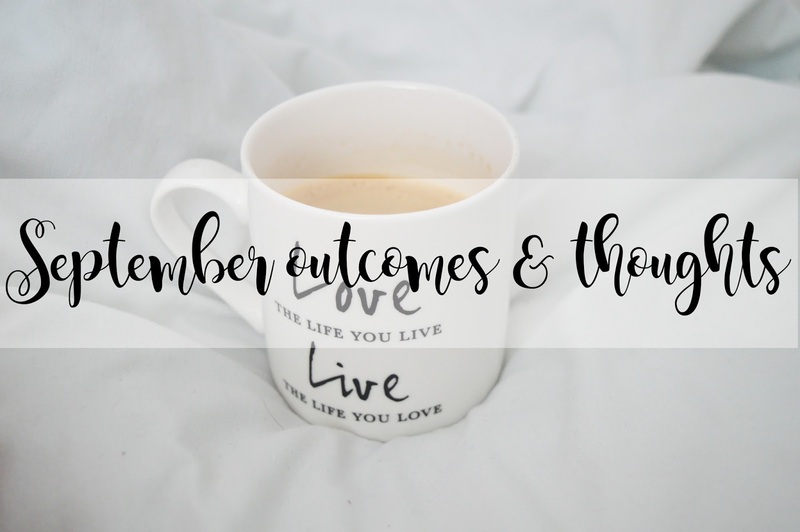 I created a post similar to this for my August Outcomes and Thoughts, after the incredible blogging experience I had in August when I had a lot of spare time on my hands to spend blogging and creating a little space of myself where I can express all of my thoughts and feelings. In September, I went back to work at the Primary School which I couldn't wait for. I've been waiting since June to go back to work and instead of being a "placement student" for University, I am now working one-to-one with a young boy who has ADHD. It's an area which I haven't experienced before and although I worked with him last year occasionally, I now work with him for nearly every minute of the day when he's at school. This is a very tiring job, not quite physically, but mentally it drains you, however I love it because every day is different. I also went back to University on the 28th September, literally within the last few days of September; what's the point? The first week of University didn't start off well. We were supposed to have a tutorial on the 26th and this had been already cancelled without telling the whole class. However, the 28th was a mixture between good and bad. The morning was absolutely amazing, I knew exactly what needed to be done for my new module and I had already completed the homework in the lecture before leaving. But, the afternoon let us down with the organisation which was rather poor and how my lecturer wanted to spend the two hours holding a girl's baby instead of telling us what we needed to do for the module. A waste of money if you ask me, but we eventually got there in the last fifteen minutes, even if she didn't explain it. Back in August I had the goal of reaching 800 followers and exceeded this to 1130 by the end of August, which I found absolutely incredible and I did feel rather proud of my blog and how much my social media accounts are growing. On the last day of September, just before I went to bed I jotted down my following on each account so I would be able to compare it to the previous month and how twitter has grown in a month shocks me, especially when I was stuck on 734 followers for months. On the 30th September, I had 2031 followers on my Twitter! If it weren't for the blogging community, I definitely wouldn't have grown my twitter following this quickly and I'm proud of it. My blog views are always on the rise and this has definitely shown itself in September. before August my blog was on around 5000-6000 total blog views and my goal for August was to be on 8000. If you have read my August outcomes and thoughts, you'll know my total blog views increased to 17,117 in month! During this month, I was posting four times a week, sometimes more, sometimes less. However, through September I made a goal for myself to blog every day throughout Autumn and I succeeded throughout September, publishing a total of 35 posts altogether in 30 days. From 17,117 blog views on the last day of August, and viewing my total stats on the last day of September, my blog reached 27,947. Writing this today (1st October) my blog is now over 28100 which is insane. It baffles me how blogging every day can make such a difference to your overall stats and how consistency really is key. Although I blog for myself, and not for the amount of followers or readers I have, it truly makes me happy seeing how much my own little blog is growing and it does bring a smile too my face because the hard work does pay off eventually. At the end of July, I only had 10 followers on my Bloglovin account. I hardly promoted via Twitter and I didn't use Instagram to promote my blog either. At the end of August my following grew to 88 on Bloglovin and has now reached 263 people on the 30th September. Being able to grow my blog was a big achievement, I really didn't think I'd ever be able to do it and it feels my heart with love knowing how many people read my blog and follow my blog via Bloglovin because two months ago, I'm sure no one really did. I love the blogging community and if you're reading this, you're a fabulous star in the sky and I thank you for joining me on this journey! Although on last month's outcomes and thoughts I didn't record my Instagram following, I thought it would be interesting if I did this month so I can compare to next month. I recently changed my Instagram "theme" if you'd like to call it. I previously used the feature picture from my blog posts however I weren't really happy with the way my Instagram was looking and so I decided to change my "theme" and the way in which I promote my blog. I wanted to use Instagram the way I use it for my personal life. Documenting everything I love through pictures, instead of just promoting the posts which I've published. I created my blog Instagram account on the last day of July and two months later my account has received 339 followers. For me, I am proud of this as I've never been able to grow my personal Instagram account, and I really didn't think I'd be able to grow my blog one either, but it's definitely worth the try if it's something you love! I love taking pictures, and I love writing about everything I have a passion for and I feel this is the best way to do it. I sometimes go through stages of whether or not I'm happy with how my blog looks, or even my Instagram and then I think about how far I've come with how it is already. Photography is always a big thing in blogging and so many people aspire to have the most amazing, bright shots they can possibly get and they use other bloggers to use as their inspiration to do this. For me, I sometimes love the way I take pictures and how my blog looks with my shots but some days, like today, I'm over thinking it way too much and I can't decided if I love it enough to keep it the way it is. Blogging is an amazing experience and in the past month I have received so many opportunities and I have grown my confidence in a way I never thought I would. In the process, I have also gained some amazing friends. Some of the girls from the #GRLPOWR group are incredible, they are girls I know I could count on if I needed a chat, even if it was something in my personal life which was bothering me. But then I have the other part of the blogging community, the individuals who stick out and are always there. If you're not part of the blogging community, join us! We'll welcome you with open arms. What are your thoughts of September? Have you met any of your goals?